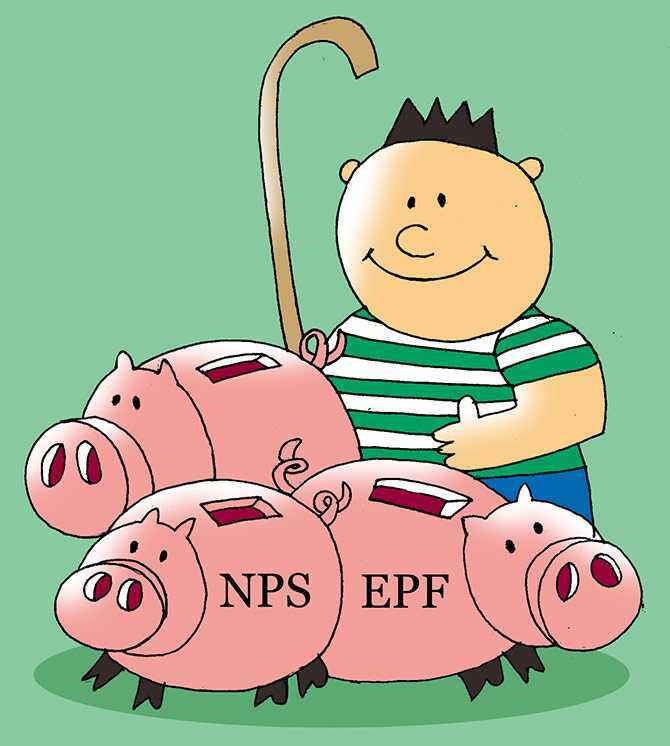 Rediff.com » Business » Should you shift to NPS from EPF? Now that the National Pension Scheme offers more choices than the Employees Provident Fund, is more transparent and also allows to choose the level of allocation to equities as investors like, should one switch to the NPS? Sanjay Kumar Singh finds out. The Pension Fund Regulatory and Development Authority, PFRDA, has through a circular dated March 6, laid down the procedure through which subscribers may shift their corpus from a recognised provident/superannuation fund to the National Pension Scheme, NPS. Experts say investors should weigh the pros and cons carefully before deciding whether to shift their corpus from the Employees Provident Fund, EPF, to NPS. The road map, as laid down by PFRDA, is as follows: An employee needs to have an active NPS Tier-I account, which can be opened through the employer, an eligible point of presence, or online through eNPS. "The employee then needs to make a request to the recognised provident fund/superannuation fund to issue a letter to his present employer mentioning that the amount is being transferred," says Nishit Dhruva, managing partner, MDP & Partners. Experts say one hitch remains. "The Employees' Provident Fund Organisation (EPFO) hasn't said anything about allowing you to shift. Only the receiver of money has laid down the procedure. The giver has to do the same," says an expert who did not wish to be identified. Experts are divided on whether you should shift your corpus. First, let us look at the points in favour of shifting. "NPS gives you more choices. You can choose the investment option (auto or active), asset allocation, and fund manager. With EPF you don't have any say in where and how your money is invested," says Arnav Pandya, a Mumbai-based financial planner. Another point in favour of NPS is that tracking your investments is easier. "Returns of NPS funds are published regularly. EPF's rate of return for the current financial year is published in November-December. Till then you are in the dark about how much your corpus will do," adds Pandya. Some financial planners favour staying put in EPF. "EPF's return is good for a debt product (8.65 per cent last year). While it is true that you should invest in equities for the long term, your retirement portfolio is not 100 per cent in equities. Stick to EPF for your debt exposure," says Deepesh Raghaw, founder, PersonalFinancePlan.in, a Sebi-registered investment advisor (RIA). EPF is also more flexible in the matter of early withdrawal. "If you have been contributing for five years, have quit your job and been unemployed for two months, you can withdraw the entire corpus. In case of NPS you have to annuitise 80 per cent of the corpus if you withdraw before 60," he says. The biggest issues experts have with NPS are taxation and annuitisation at withdrawal. Sixty per cent of the NPS corpus is taxed on withdrawal while the entire EPF corpus is exempt. Forty per cent of the NPS corpus has to be annuitised. Rates of return are low on annuities. Parity in tax treatment for EPF and NPS has been under discussion. An alternative non-guaranteed withdrawal structure, akin to a systematic withdrawal plan, SWP, is also under discussion. But nobody knows if and when these changes will happen. For most people, it makes sense to stay put in EPF and invest in NPS additionally. Shifting the corpus may make sense only for young investors with a high risk appetite. "Those below 35, and having the appetite for high exposure to equities, may shift their corpus to NPS as their longer investment horizon may allow them to accumulate a bigger amount despite the less favourable tax treatment," says Vishal Dhawan, chief financial planner, Plan Ahead Wealth Advisors.